Hello Quiche! We love quiche recipes at our house because they work for both breakfast and dinner. Plus, they're great for make ahead suppers too. You can assemble this up to the day before, keep it covered in the fridge and then pop it in the oven to bake before supper (or breakfast). Oh, and don't forget- BACON! 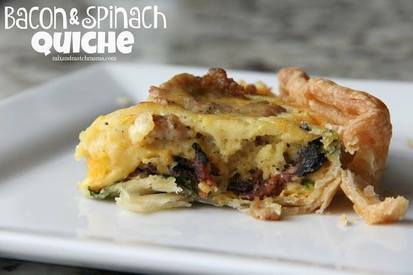 Find this recipe here: http://mixandmatchmama.blogspot.com/2016/01/bacon-spinach-quiche.html?